Do this, don’t do that, we are bombarded by signs that dictate a course of preferred behaviors throughout our daily lives. Almost all of these signs are easy to recognize as they garner our attention with their vibrant colors and clear messages. However, identifying potentially deadly behaviors is not as clear cut a task. What causes the rise in ? In recent years we have seen a dramatic increase in violent encounters and deadly outcomes within the schools and workplaces of the United States. It is estimated that there is a mass shooting – defined as four or more people shot in one incident, 9 out of every 10 days on average within the United States1Innocent lives are being lost at a rate never seen before and there is no apparent remedy for this national epidemic. But, is there a way to better recognize the possible indicators of a person that is contemplating a mass shooting? 1. Anti-Social Behaviors - Trouble getting along with others, disrespect for authority. 2. Vindictiveness - Blaming others for their problems, holding grudges, and celebrating the suffering of others. 3. Persistent Anger – Rage, temper tantrums, and excessive yelling, swearing, and use of overly emotional language. 4. Violent Thoughts – Repetitive statements about causing harm to others, celebrating rather than commiserating over news of mass shootings. 5. Difficulty Holding Jobs – Unsettling behaviors make it difficult to sustain employment. Past behavior is a reliable indicator of future performance. 6. Unhealthy Habits – Neglect of personal hygiene, disheveled appearance and a consistent disregard for self may signal emotional turmoil. In regards to the School Shooter, I believe that the most important characteristic to be observed is that of the “bullied” child. The perpetual mistreatment by peers serves only to feed the psyche of retribution. The damage done to the individual who suffers from a daily regimen of bullying is immeasurable. It is imperative that we increase our efforts to recognize the signs of bullying and put into practice a zero tolerance policy. 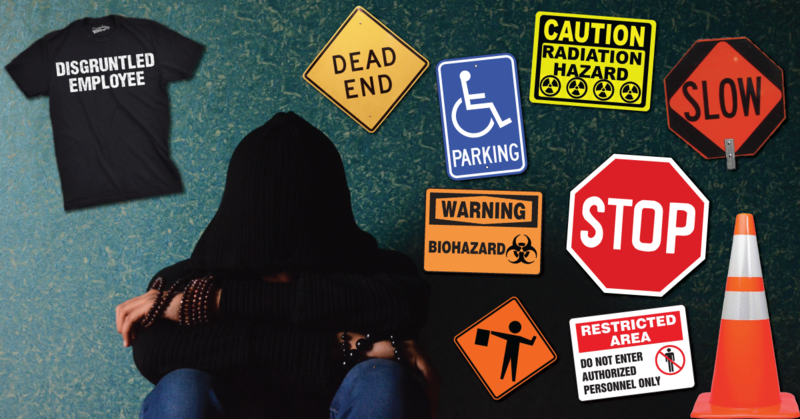 It is essential that we remain vigilant in our efforts to recognize the warning signs of potential danger in our workplaces, schools, churches, and everywhere in between. Don’t be afraid to report your concerns to administrators or law enforcement. What you don’t say could mean the difference between life and death.